Student Driven. Competitive Excellence. One Community. Interested in joining the UBC community as an official Sport Clubs student-athlete? This is a great opportunity to connect with other students who are passionate about your sport, or previously played while growing up. Excelling on the field, in the classroom, and in the campus community is encouraged. Each individual Sport Club hosts tryouts every year, typically in September. Connect with specific teams via email or keep an eye on each club’s page for updates on tryouts. Although previous experience is an asset, we encourage those who would like to try something new to contact the team executives for more information. If you make the team you also have the opportunity to hold various executive positions in each club. How much time is dedicated to a team per week? The amount of time dedicated to practices and games will often vary per team, however expect on average two (2) practices per week and a tournament/game on weekends. Practices from 9:00 - 10:30 pm on Tuesdays and Thursdays, Games on Saturday nights at 8:00 pm, Team gym sessions on Sunday evenings from 7:00 - 8:30 pm. Total = a minimum of 7 hours per week. Those interested in holding executive positions on Sport Club teams should expect an additional 5-10 hours of responsibilities aside from practice/gym times and games. Do Sport Club teams travel for competition? In 2017-18 some teams travelled to Victoria (BC), Edmonton (AB), Kingston (ON), Lake Placid (NY), Seattle (WA), Milwaukee (WI), and Fremont (CA), just to name a few places. 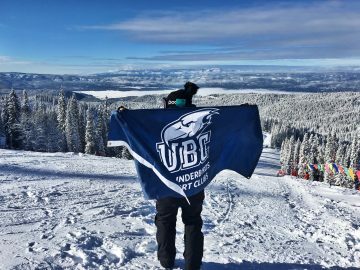 We encourage all students at UBC - Domestic, International, or Exchange students to participate in UBC Thunderbirds Sport Clubs! 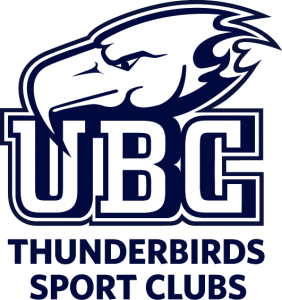 If you are arriving at UBC in Term 2 (January), please contact the specific Sport Club Executives regarding try-outs or playing for the team.